CHEYENNE, Wyo. 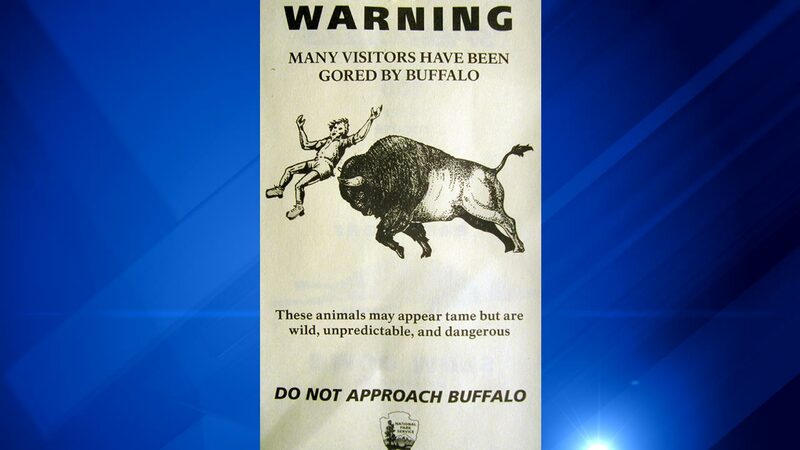 -- A pamphlet drawing of a man being gored and flung into the air graphically warns tourists in Yellowstone National Park not to get too close to bison: They're wild animals and can be very dangerous. Rangers distribute the flyer to people as they enter the park, but some visitors still aren't getting the message. Bison have gored two people in the Old Faithful area within the past three weeks. The latest attack Tuesday was an especially violent scene, as a bison charged a 62-year-old Australian man and flung him into the air several times. A male American bison can weigh up to 2,000 pounds, bigger than a Smart car. They have horns that aren't just for grubbing around for tasty shoots. Bison often behave much like cattle, lumbering about and lazing in the sunshine. But when they get a mind to, they can run up to 40 mph, or almost twice as fast as Usain Bolt's world-record speed in the 100-meter dash. "I just don't think people realize how fast bison move. They're big animals, but they move quickly. And so when a bison becomes agitated, it doesn't take him long to cover that short distance," Yellowstone spokeswoman Amy Bartlett said. The unidentified Australian was flown by helicopter to a hospital where he was treated for serious injuries and released Tuesday night. The attack happened as a group of people crowded near the bison as it lay on grass near a paved trail. The man was taking photos of the shaggy beast from just a few feet, but the whole crowd was much too close, park officials said. Any less than 75 feet is unsafe, they warn. Also, stop staring at your camera or phone, be aware of your surroundings, and know that Yellowstone's wild animals are free to roam where they please. If a bison is near a trail, don't go down that trail. "Just because the animal is near the trail or boardwalk doesn't mean it's tame," Bartlett said. Yellowstone's summer tourist season began a month ago and already the park has had some dicey run-ins between wildlife and tourists. A recent videotape showed camera-clicking tourists scrambling for their vehicles as a black bear and her cubs tried to cross a bridge in Yellowstone and began running in their direction. Then on May 16, a bison in the Old Faithful area gored a 16-year-old girl from Taiwan as she posed for a picture near the animal. She also was treated at a hospital for serious injuries and released. Some who encounter bears in Yellowstone aren't so fortunate. Grizzly and black bears have killed more than 40 people in Yellowstone in the past 30 years. But bison - and elk, especially the big-antlered males during mating season each fall - are responsible more injuries to people, at least a couple every year. And Yellowstone has far too many tourists and wildlife for park rangers to even try to police every possible situation. "A ranger can't be at every bison all the time," Bartlett said. "So people need to keep that common sense."